Clarksville, TN – After three consecutive weekends playing just a single match, Austin Peay State University women’s soccer team jumps right into the teeth of its Ohio Valley Conference schedule when the Lady Govs host Eastern Kentucky (7:00pm, Friday) before traveling to face defending OVC Tournament champion Morehead State (noon, Sunday). The beginning of the OVC schedule offers a clean slate to Austin Peay, which has struggled to a 1-7-0 start in 2014. The offense recently snapped a long scoring drought but the Lady Govs have been outscored 20-6 so far in 2014, with five of their goals coming in a 5-2 rout of Chattanooga, August 24th. The keeper position has remained unsettled up to the start of OVC play. 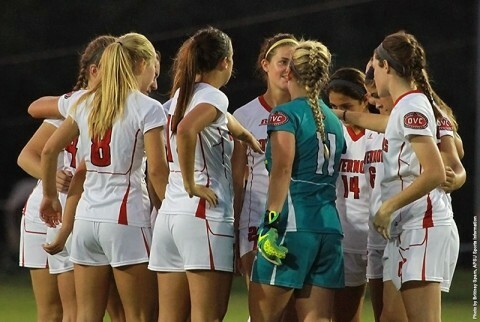 Junior Nikki Filippone has the most saves (23) and highest save percentage (.793), but both sophomore Katie Emig and freshman Lindsey Todd have continued to see work in net – Todd’s six-save second half two weeks ago against Ole Miss remains the most impressive half put together by an Austin Peay keeper in 2014. Eastern Kentucky (2-7-0) finds itself alongside Austin Peay at the bottom of the OVC table as conference play gets underway. 2013 OVC All-Freshman honoree Cassie Smith leads the Colonels with four goals, but the visitors from Richmond, Ky. are in the midst of a seven-match losing streak and are winless in September. Morehead State (5-2-3) features OVC-leading scorer Jade Flory (7 goals, 2 assists), who looks poised to repeat her OVC Offensive Player of the Year performance from a year ago. Her efforts are supplemented by Elizabeth Floyd in net, who is allowing just over a goal per match (1.03 GAA) and has 26 saves in 2014. Eastern Kentucky shocked a reeling Lady Govs squad with a 3-2 defeat, Oct. 20, 2013, the final match of Austin Peay’s first three-match losing streak in over two years. Shelby Olszewski and Morgan Zigelsky tallied scores for Austin Peay. Morehead State handed Austin Peay two losses in 2013: a 3-2 loss preceding the aforementioned match against the Colonels and a 4-2 defeat in the OVC Tournament semifinals, where the Eagles would go on to claim the crown. All-time, Austin Peay is 2-4-2 against Eastern Kentucky and 3-9-2 against Morehead State. Sophomore Gina Fabbro needs one goal to tie Jocelyn Murdoch (2008, 10-12) for 10th all-time. After making just 70 saves in 2013 (3.68/g), Austin Peay keepers have combined for 51 saves through eight matches in 2014 (6.38/g), with Nikki Filippone leading the way with 23 stops. Backed into a corner: Austin Peay has taken just 12 corner kicks this season, compared to 49 for their opponents. Morehead State leads the OVC with 52 corner kicks this season, while Eastern Kentucky is fourth with 39. Be sure to follow all the Lady Govs action at www.LetsGoPeay.com , and check them out on Twitter (@AustinPeaySocr) and by liking the Austin Peay’s Official Athletics Facebook page. Live stats will be available during the match at LetsGoPeay.com, while a live stream of the match will be available on the OVC Digital Network.